Predict the intestinal permeability and oral absorption of your test compound using our Caco-2 permeability assay. In this assay, Caco-2 cells are cultured on transwell membranes (0.4 um) for approximately 3 weeks in order to establish a fully differentiated monolayer. The test compound and controls are applied to the apical surface and the rate of transport across the barrier over time is measured. 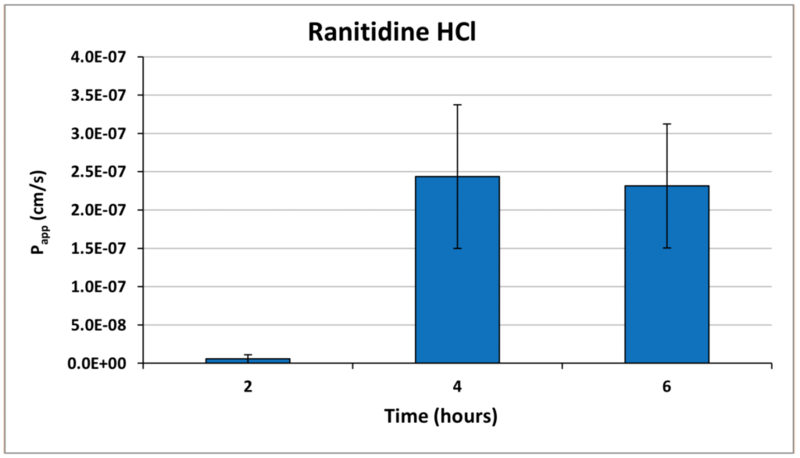 Control compounds for low (Ranitidine) and high (pindolol) permeability are always included in order to monitor assay performance. where dQ/dt is the steady-state ﬂux (mmol/second), A is the surface area of the ﬁlter (cm2) and C0 is the initial concentration in the donor chamber (mM). The mass balance (experimental recovery) is also calculated. Additional assessments of the test compound can be made as well. These include the efflux ratio (measured by assessing the basal to apical Papp as well as the standard apical to basal Papp). This information can also determine whether the test compound is actively transported by P-glycoprotein (P-gp). The graphs illustrate the consistency and reproducibility of the positive control data over multiple separate experiments for the Caco-2 permeability assay. 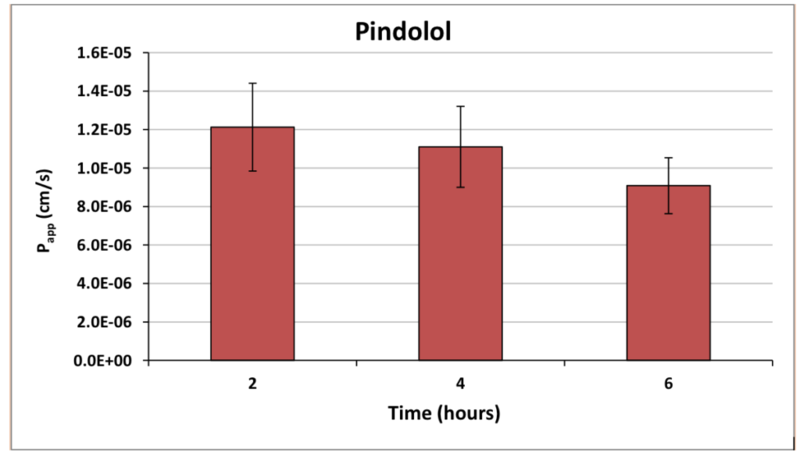 Ranitidine hydrochloride is the low permeability control while pindolol is the high permeability control. IONTOX’s Caco-2 permeability assay can be combined with our Human Dynamic Multiple Organ Plate to assess the downstream effects of metabolites or permeable parent compound on subsequent tissues, such as liver and/or kidney. 1. Hubatsch, I et al. (2007) Nature Protocols 2(9); 2111-2119.